Episode 12 – Terminator 3: Rise of the Machines (2003) with Dave Brouillette | Podcasta la Vista, Baby! In Week Three of Terminator Month, we arrive in the post-James Cameron era of the franchise to rob a veterinary clinic and destroy downtown Los Angeles with Dave Brouillette of the Hands Free Football podcast. 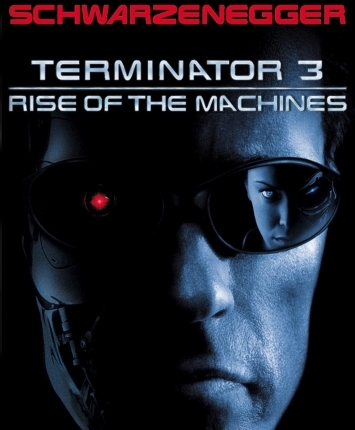 Our mission, to dig into the long-anticipated sequel that returned Arnold Schwarzenegger to the series that made him a star: Terminator 3: Rise of the Machines. Now in his twenties, John Connor is living off the grid. Moving from town to town; job to job, running from his destiny as the would-be savior of the human race. And just when he thinks the future is safe, two more Terminators arrive from the future; one a killer and the other a protector. But this time, maybe nothing can stop worldwide nuclear doom. This entry was posted in New Episode and tagged arnold schwarzenegger, bad sound design, claire danes, dave brouillette, good ending, judgment day, kristanna loken, nick stahl, talk to the hand, terminator 3: rise of the machines, terminator month, we miss james cameron by Mike Gillis. Bookmark the permalink.